Check the Fien Print: MovieWatch: "I'm Not There"
In a Nutshell: Requisite background: Unlike "Control," which I went into knowing scarcely anything about Joy Division or the necessary musical background, I went into "I'm Not There" as a Bob Dylan fan. Of course, there are Bob Dylan fans and there are Dylan-ologists and I'm in that latter group. Between tapes, CDs and my iPod, I have at least 15 Dylan albums. I've seen him in concert (but only once) and when we had to do an AP English essay on the poet of our choosing, I picked Dylan, because I was that kind of obnoxious kid. "I'm Not There," isn't a film for Dylan fans. It's a film for Dylan-ologists and this Dylan fan left the theater after this one unmoved. For more, follow through after the bump. The line between Dylan fandom and Dylan obsession is like the difference between fans of "Lost" and obsessives. The fan of "Lost" watches every new episode and chats about the show with friends. He or she may own the seasons on DVD and may even occasionally read a recap or message board on a site like TV Without Pity or Zap2it. The obsessive fan watches every episode two or three times, reads every available message board or blog, particularly the ones with screenshots. The obsessive fan has tallied up every clue and they think they have a hunch about each and every mystery of The Island, even if smart money suggests that none of the people directly involved with the show have any idea about all of the mysteries. The obsessive fan believes that Damon Lindelof and Charlton Cuse deliver every interview in complicated acrostics and numerological patters and that even the interviews that appear to say nothing, actually say EVERYTHING, if you just run them through Babelfish into Greek and then take the first letter of every word. The obsessive Dylan was was like the obsessive "Lost" fan only 40 years earlier. They know every bootleg, every still photograph and they certainly know that no matter how cryptic Dylan has always been in interviews, his words are revelatory if you know how to read they. They know what each song *literally* refers to and then they know a half dozen potential metaphorical meanings proving that Dylan was like Nostradamus with a harmonica. Just as "Lost" obsessives find endless merit even in the sluggish second season, Dylan obsessives find deep meaning in his Christian period, even when he was just singing about how God gave names to all the animals, in the beginning. "I'm Not There" is Todd Haynes' second straight movie that seems designed for an elaborate DVD that includes an annotated bibliography and perhaps even a "Pop Up Fact" commentary. It's less a movie than an accumulation of information delivered with intellectual rigor and cinematic precision. As I watched, I was never engaged with the movie, because all I could do was keep thinking... "Oooh, that frame looks like the cover of that album." "Oooh, that was a quote Dylan told Rolling Stone." "Oooh, that composite character is obviously based on that person." "Oooh, that image is supposed to remind me of the lyric from that song." "Oooh, that character became that person from that song." Haynes delivers an entire movie that's like a tongue-in-cheek code. Every shot and every line screams, "If you get the reference, you'll think this is brilliant and if you don't, you probably shouldn't be watching the movie anyway." My problem with "Control," as readers will remember, was that it was too traditional a biopic, that it went through the same rise and fall narrative tropes as an ever proliferating number of musical movies. Dylan's first 15 years in the public eye have the drug use, infidelity and action too, so I guess I should salute Haynes for not kowtowing to the overall cinematic trend. "I'm Not There" is a thesis statement from Haynes. 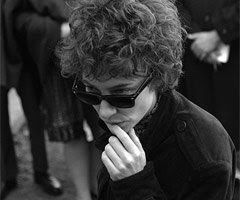 Bob Dylan was an enigma, such an unknowable man and multi-faceted man that he can't be played by just one actor. So the thesis statement says that the only way to capture the man is to have him played by Christian Bale, Heath Ledger, Ben Whishaw, Richard Gere, Cate Blanchett and Marcus Carl Franklin. The movie, though, just lets the thesis statement stand in for actual insight. Seeing the movie does nothing more than being told the premise and casting for the movie. The first three actors listed above undermine Haynes whole thesis, because they don't accentuate different sides of Dylan so much as they're vaguely similar actors playing characters based on different periods of Dylan's life. The characters aren't interchangeable, but the actors playing them really could be. Does anybody honestly believe that Whishaw, Ledger and Bale couldn't have just played each other's parts? They variably affect similar aspects of Dylan's mannerisms and his speech patterns and if Bale's version is more mumbly and Ledger's version is more obnoxious and ego-driven, that's just because of the writing. In a normal biopic, the same actor would have played both sides of the character as his life progressed and it wouldn't have been any more or less illuminating. Because Blanchett, Franklin and Gere aren't lanky, young, angular white men with poorly covered accents, they at least provide the jarring contrast that Haynes hopes for. Franklin's plucky liar and appropriator, Blanchett's self-destructive prankster and Gere's prematurely abdicated prophet stand out because they aren't just more of the same. Having Blanchett playing the Dylan from D.A. Pennebaker's "Don't Look Back" causes a different assessment of the man himself. Having Dylan suddenly become a woman, suddenly become a figure with comedic potential, suddenly have a new frailty and body language is instructive in a way that going from Bale to Ledger just can't be. Franklin deserves more credit for being the only one of the Dylan proxies to actually sing on the soundtrack. Gere's segment, an even more post-modern take that requires knowledge not only of Dylan, but of Sam Peckinpah's "Pat Garrett & Billy the Kid," is the least fully realized part of the movie and the part most likely to flummox the semi-enlightened. The movie is so full of intellectual pretensions that I could almost talk endlessly about it without talking about its cinematic merits like Ed Lachman's beautifully varied cinematography and a soundtrack that delivers a phenomenal sampling of Dylan classics. Just because the storytelling often failed to involve me doesn't mean I wasn't enjoying just sitting there and humming along. But if you reduce Bob Dylan to some unknowable puzzle whose mystery began in 1959 and ended in 1973 (or 1978 or whatever), you're ignoring something about Bob Dylan. You're reducing his musical genius to a serious of period footnotes, footnotes that have nothing to do with the fact that Dylan's last three albums have been among the best of his career. The reasons I love Dylan have nothing to do with the semiotic conundrum Haynes poses -- and the myriad recognizable actors donning funny beards and wild hair to play him -- and everything to do with "Time Out of Mind" and "Love and Theft" being every bit as beautifully written (and far more musically complex) as anything he wrote before he "plugged in." I don't feel the desire to crack the riddle of Bob Dylan and since Haynes film comes to the eventual conclusion that even after 135 minutes, Bob Dylan isn't really understandable at all, I wasn't sure the game was worth the candle. Dylanologist? It sounds like you went into the movie a Dylanologist and walked out a Dylan fan? No, no. I've always just been a fan. At times I've been a passionate fan, but a 12th grade English essay analyzing the guy's lyrics falls far short of the requirements of being a Dylanologist. I just got around to seeing it, and wanted to make this comment somewhere. I don't even qualify as a Dylan fan - I know the songs that get played on classic rock radio and that's about it. But my take on the movie was that maybe the whole damn thing was a put-on. Just like Haynes is obviously parodying a Behind the Music episode in the Christian Bale sequence, maybe the whole movie is a subtle parody of someone making a reverential art film about Dylan. I mean, the 6 different actors, and the fake documentary, and the multiple roles, and the 5 zillion cigarettes he smokes, and the flashbacks Woody has underwater, and the obvious over-the-topness of the upset folk fans, and the impenetrableness of the Richard Gere scenes, etc, etc. NetflixWatch: "Civic Duty," "Severance" "1408"
MovieWatch: "No Country For Old Men"
MovieWatch: "Before the Devil Knows You're Dead"